San Jose is a heart of well-known Silicon Valley – a name which has become a synonymous of success and high living standards. Today the city is the largest one in Northern California with a population of 1,055, 134 people. Many people moving to San Jose these days because of the advantages the city has to offer. The city is famous not just for its technological achievements. San Jose is a truly cosmopolitan place with a great diversity of nations and languages. Of course, the official language is English, but you can hear on the streets Spanish or Chinese. The city continues to experience a big population growth – for the last ten years, it grew by 10 percent. High economic growth in the area impacted real estate prices and the cost of living in the area. Nowadays many tech companies continue to appear in San Jose. That is increases the number of job opportunities. Why should you move to San Jose? San Jose is an amazing place to explore and live in. It has everything for a happy and interesting life. It would be very hard to count every advantage you can get living here, but we will try to show you at least some of them. Flawless climate conditions in San Jose allow its residents to experience the pleasure of outdoor activities and sunshine three hundred days per year. Rainfalls come only in winter and continue just a few weeks. The coldest month is January with a temperature of 72°F. It is a great place for those who like gardening – the growing season lasts almost all the year long. You already know how diverse the population in San Jose. Well, you will be thrilled to learn that there is much more. San Jose has an amazing, rich food scene from all over the world. You can try something different every day. The selection of excellent restaurants will help you to taste European or Asian cuisine any time you want. There is no room for doubt – all the food is truly authentic. At the moment San Jose experiencing amazing economic growth. It also affects the variety of job positions. Remember the fact, that San Jose area is one where people experience the highest level of happiness at work, according to recent research on the subject. A great range of companies has offices here in San Jose – from Google and Adobe to less famous but still creative and prestigious startups. San Jose is full of great education facilities. There are four unified school districts with a number of elementary and high schools. You will find here a very famous one around the world – San Jose State University – which is also the oldest institution on the west coast. Among the others are Evergreen Valley College, Silicon Valley University, and a few less famous facilities. As we were mentioned before, the weather in San Jose is always great and very suitable for outdoor activities. In addition to that, the place has vast recreational areas for different activities. There are almost 16,000 acres of parks in the city. Some of them reflect history, like the Emma Prusch Farm Park which shows signs of agricultural past. You can stroll, joggle, cycle or simply walk with your dog. There is always a good place for such a things. San Jose is surrounded by beautiful nature and notable places to visit or spent a vacation in. Let’s start with a simple fact that only two hours of car drive separate you from one of the most famous destinations in the world – San Francisco city. Those who live in San Jose usually take the option to go on a short trip to the Bay Area. Not that far you will also find Napa Valley wine region. Do not miss the chance to taste the best wine in the area! Even if you never been in San Jose or Santa Clara County, you probably have heard of Pebble Beach and Santa Cruz, and of course you familiar with a Monterey. So, you will be glad to know that these places are reachable from San Jose too. 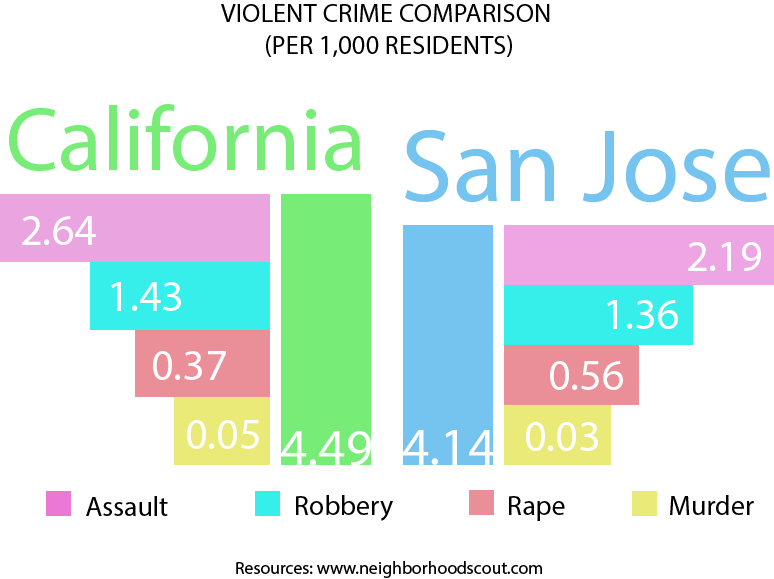 The city’s residents have a very low risk to be robbed or become a victim of a violent crime. Even though San Jose is a huge city, the level of security here is just a great example for the urban giants. You can safely walk at nights without fear to experience any danger from some stranger. San Jose is a host to a number of seasonal and annual events. Residents enjoy summer cinema festivals, the Jazz on the Plazz music event, days of art and simple exhibitions from time to time. If you have kids, you will find many places to amuse them. There are art camps, theme parks, specially designed museum tours for kids. The city full of beautiful architectural styles – Victorian, Craftsman, Mission Revival and the others. 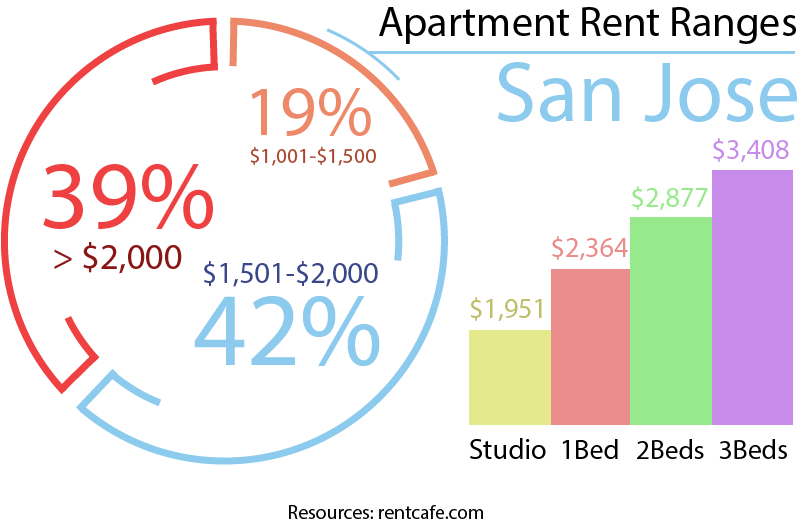 San Jose has one of the highest position in the world when it comes to home or rental price. Today the median home value in San Jose is $1,087,500. If you want to rent a place it would costs you about $2600. San Jose is one of the 5th the most expansive cities to move to. Not to mention that it is very hard to own your personal apartment. If you are moving to San Jose from other states it can make a real difference for you financially – California always been an expensive state. Traffic issue is a very common problem for all big cities without exception. Even if you know it is normal because of a general number of population and all the vehicles, it nevertheless will steal your time and annoy you. If you like to have fun and dance at night clubs or listen to some live music after midnight, you will probably be disappointed. As much the day life in San Jose vivid and vivacious the night life mostly calm and quiet. You will definitely enjoy local architecture with beautiful houses from different time periods, that is for sure. But nowadays tech giants have been able to find a reason to build more modern buildings among amazing old-fashion homes. Some areas in the city look overbuilt, with no room for walking. For some people, such a look can be a bit of a problem. Obtain a driver’s license if you have a car. If you are moving from another state, you can keep your old one, but you have to change the address you are going to left to a new one. Contact your utility providers and inform them about your move. Learn every corner in your new place – maybe something has to be improved. Hire a dependable moving company – explore what kind of relocation you need and find a professional crew to perform this task. It will guarantee you at least a few simple things: your personal possession won’t be damaged, your move will be done relatively quickly and it will save you lots of energy. Our California moving company can help you to have a pleasant, stress-free relocation experience. If you think about all the necessary stages of moving to another city, you will find some of them complicated and quite hard to perform it properly, and also very stressful. That is why you must use the help from professional movers, who already know how to handle any moving situation. If you hire us, our professional movers will plan the whole relocation procedure to the utmost. We create the exact timeframes, so our client, as well as the moving team, will know how much time the delivery can take. We perform everything – packing, loading, protecting fragile items. Once you became a resident of San Jose, you will never stop enjoying the local landscape. The most beautiful thing about the city is its greenness. Any part of San Jose will please your eye with its beauty. Situated south to downtown of the city, this neighborhood is full of old buildings with a long history and beautiful atmosphere. This place is a very good destination for families with children who looking for a calm and nice surrounding apart from noisy streets and huge buildings. With a population of 80 000 residents, the place has a very low percentage of crimes. The median home value is $802,266, rent -$1,647. There is a rather big variety of the houses, dining places and recreation areas. You will experience here suburban atmosphere. The number of population in Almaden Valley is 40,581. The median home value is $1,116,341, the median rent price – $1,425. It is located in the west part of San Jose. The urban place where there are more than a half of residents own their homes. There are lots of coffee shops and restaurants. There are a few good public schools with high rates. The median home value is cheaper than in other areas – $764,122, as well as the median rent price – $1,737. It it a charming place partly located on the hills of Santa Cruz mountains. Local community live in nice and cozy Victorian houses. If you fond of bikes and long strolls you schould come here without hesitations. The place is also considered as one of the best to move to not just to San Jose, but to Santa Clara county generally. The median home value is $1,476,700, the average rent price is $2,111. The best area if you want to reside with your children. Excellent education, great learning facilities and nice elementary schools are the main features of Cupertino. At the beginning of millennia many city’s residents came from different parts of Asia. Even now you can feel some Asian influence there. The median home value is $1,372,800, the median rent price is $2,829.